Caring for your horse holistically can entail many separate activities, but one of the most important factors to consider is how you are supporting your horse’s immune system. Holistic care means minimizing the use of drugs and vaccines and maximizing the horse’s natural immune system. Unfortunately, many well-intentioned horse lovers don’t understand that stress can significantly weaken the immune system, and fail to manage their horse’s environment to reduce stress. All forms of stress have the potential of suppressing the immune system, at least temporarily. If stress becomes a persistent part of the horse’s life, the immune system could sustain long-term damage and subject the horse to the risk of such health concerns as frequent infections. Horses suffer from many sources of stress, and this month I cover three of the most important: emotional, toxic, and nutritional stress. Next month I will cover stress that results from overwork, chronic infection, and chronic pain. I start with this form of stress because I feel that it is the most important. Horses are social creatures and it is imperative that they have companionship. Ideally, it is best for them to be turned out in a herd situation where they can form lasting relationships and maintain a stable herd hierarchy. Unfortunately, many horses are kept and raised in stalls or small pens. If a horse must be kept separate from other horses he should have some kind of a companion, such as a goat, cat, or even a chicken. Training can be another huge source of stress. If a horse is physically or mentally unsuitable for the activities he is being asked to perform, he will experience constant stress. If asked to continue with work he either is unsuited to or dislikes, he will require lots of extra praise and reward for doing his best. Indeed, to maintain a harmonious human-horse relationship, sometimes an owner must lower her expectations of the horse’s performance to match his capabilities. Even if a horse loves his job and is naturally gifted at it, he can still experience stress during training. 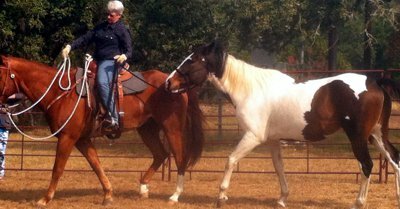 If the trainer loses focus or gives unclear signals, the horse can quickly become confused. Punishing a horse who is unclear about what he is being asked to do is certain to cause stress. Indeed, punishment for any reason will produce stress in a horse. Horses in this kind of poor training environment often break down despite a moderate workload, while a horse who clearly understands what is being asked and is handled in a consistent, supportive manner can withstand much heavier workloads. Other emotional stresses include personality clashes with owners, trainers, barn staff, or other animals in the barn. Like people, horses have individual personalities. Paying attention to each horse’s special needs will pay off with fewer health problems and a stronger immune system. My mule, Tess, is the perfect example. She gets upset when separated from her donkey friend, Lady. Tess is perfectly happy to go out on trail rides without Lady, but if I am working with her in the barn, it is easier for everyone involved if I ensure that Lady is within sight. Stress, whether physical or emotional, generates immediate responses in two areas of the brain, the hypothalamus and the hippocampus, that result in the release of a specific adrenal gland hormone known as cortisol. Increased concentrations of cortisol can directly impact elements of white blood cells that are at the source of cellular immunity. The more frequently stress occurs the more likely a horse’s immune system will be affected, ultimately increasing the risk of infections. Horses are exposed to more chemicals in their environment than ever, including insecticides, herbicides, drugs, dewormers, vaccines, synthetic vitamins, and preservatives, all of which take their toll on the horse’s detoxification mechanism. When toxins enter the body the primary organs called upon to rid the toxic substances are the liver and the kidneys. The liver acts as blood filter, ‘clearing’ toxins from the circulating blood that then travels to the other organs of the body to receive oxygen and nutrients. At the other end of the process, the kidneys excrete wastes, including toxins. Both these organs are vital to the horse’s immune function, and the stress placed upon them by toxins puts extra strain on an already deficient immune system. A specific example of the extremely potent damage toxins can wreak on the immune system is the ever-growing research evidence that indicates that toxins, such as vaccinations, can induce acute laminitic episodes in horses with underlying metabolic imbalances. This occurs because toxins push the already deficient elements of white blood cells, commonly found in horses with a metabolic disease, past their ability to respond. The evidence strongly suggests that the risk of a first episode of laminae separation is highly likely when a horse with EMS (Equine Metabolic Syndrome) receives a toxic substance. At this point the horse is unable to handle stress of any kind and his immune function can only be restored by careful management, nutrition, and specifically formulated herbal supplements to restore the immune system. This process can take months to years. Horses who are underfed can have weak immune systems but many fat horses are equally at risk if they have specific nutritional deficiencies or imbalances. I see a great many horses who have micronutrient imbalances involving vitamins and trace minerals. I do not believe that synthetic vitamins are as bio-available to the horse as the vitamins in food sources. Although similar in structure, synthetic vitamins are often mirror images of natural ones, and lack the important cofactors necessary for the vitamin to function as intended. If sufficient supplies exist, these cofactors can be pulled from other areas of the body, but if not, the body cannot use most or all of these synthetic vitamins and must expend energy to expel them. In contrast, vitamins from whole food sources are totally complete and bio-available. If the body doesn’t need them, they pass through the body unaltered. In humans, vitamin C is one of the vitamins often associated with immune function. Limes and foods high in vitamin C will quickly heal scurvy, a condition associated with lack of vitamin C, but synthetic forms of this vitamin have little or no effect on this condition. As with vitamins, it is best to offer horses minerals in food. Horses can digest inorganic materials to some extent if they have healthy bacteria in their large intestine, but not as well as cattle. Because most mineral blocks are designed for cattle, they will be of little use to horses. Lack of or imbalanced essential fatty acids can also affect the immune system. While omega-6 fatty acids are readily available in common vegetable oils, omega-3 acids are only found in fish oils and less common oils like flax. Because there has been some concern about feeding flax oil, some people are looking to hemp or chia seed as a source of omega-3 fatty acids. You can safely feed fish oil to your horse so long as it comes from fish harvested from pure uncontaminated waters. Excess omega-6 fatty acids will trigger inflammation in body, which increases the need for antioxidants. Blue-green algae is a great source of naturally-occurring vitamins, minerals, fatty acids, and antioxidants. If your horse needs additional antioxidants, consider adding natural juices, such as noni or mangosteen, to the diet. CoQ10, wheat sprouts, and grape seeds are other sources of antioxidants from whole food sources. Antioxidants from non-food sources are not only unhelpful, but may actually be harmful. Another way to support the immune system, albeit indirectly, is to feed probiotics and/or digestive enzymes. Some strains of probiotic bacteria produce natural antibiotics to help kill pathogens your horse may ingest. Probiotics and enzymes work together to keep the intestinal lining healthy so fewer toxins are absorbed into the bloodstream. Protecting and supporting a horse’s immune system is much more involved than just giving vaccines and regular dewormers. In many cases the excessive use of these products can actually damage an immune system already stressed by numerous environmental factors. A horse is only as healthy as his immune system. If you pause to consider and minimize all the sources of stress mentioned above your horse should be able to live a long and happy life!